Of all the mineral nutrients needed by plants, nitrogen is unique. The others all come from the mineral fragments that make up soil, formed over millennia from the rock of the Earth’s crust. But nitrogen is different, coming from the vast amount of nitrogen gas in our atmosphere, but unavailable until turned into compounds that dissolve in the soil water, where they can be absorbed and used by plants to make proteins. That process – turning nitrogen gas into ammonium salts in the soil – is what we call Nitrogen Fixation. There are several ways this happens, but one important way involves an extraordinary relationship between plants and bacteria, and this is often what people are thinking about when they ask about nitrogen fixation. Humans have known for a long time that farming takes nutrients from the soil, slowly depleting it so that yields fall steadily. By around 1750 a new method of farming replaced the old system, dating back to Roman times, of each year leaving one-third of the land un-cropped – called fallowing. Although this method kept the land fertile it meant small yields and it kept farmers at subsistence level. This new system grew a crop on the land every year, but in the fourth year the field was planted with clover, a pea-family plant that performs the miracle of nitrogen-fixation, trapping the needed nitrogen back into the soil and restoring the fertility of the land. This new system was essential to produce the extra food needed as the Industrial Revolution took people out of the country and into the cities to work in factories instead of on farms. Living free in the soil are a number of micro-organisms – bacteria – that are able to supply their needs for nitrogen by taking it directly from the air. When they die the nitrogen they have ‘fixed’ is released into the soil, where it can be used by plants. Eventually one of these bacteria found a way to have a safe home where it could grow. It joined with plants of the pea-family and grew inside special nodules on the roots of these plants. Plants in this family, called Legumes, include alfalfa, clover, peas, beans, soya, peanuts and many wild species as well. The Rhizobium bacteria grew well inside these nodules, getting water, safety and some nutrients from the peas and in turn giving the plants nitrogen so they can grow on poor soil where other plants cannot, avoiding competition and thriving. When the plants die the nitrogen enters the soil, enriching it and allowing other crops to grow. We now know that some other plants also have bacteria in their roots that provide nitrogen. These typically grow on poor soil, using the ‘edge’ the bacteria give them. However the Rhizobium/Legume connection is by far the most important type of nitrogen fixation we find in nature. That first revolution in agriculture was followed by a second, also involving nitrogen. As the demand for higher food production grew, farmers turned to supplementary sources of nitrogen. The first was guano, the accumulated excrement of sea-birds. In most places this would be washed away by rain, but in Peru there are areas where rain almost never falls and there it built up into layers many feet thick. This material was treasured by the Incas for fertilizer and when Westerners discovered it a brisk trade developed. The second material also came from South America. In Chile there are vast deposits of saltpeter, a water-soluble nitrogen mineral that can only form where there is no rain. This too became a huge international trade. Saltpeter is also used for gunpowder, so when the First World War broke out the Allies blockaded Germany, preventing supplies of saltpeter reaching them and threatening their war effort. A scientist called Fritz Haber had already built on earlier research and developed a method for making ammonia out of the atmosphere – industrial nitrogen fixation. During WWI that ammonia was at first used to make explosives, keeping the war going for several years, but after the war it began to be used to make fertilizers, just as the supplies of guano and saltpeter began to dwindle. Today this Haber Process is still the main method used to manufacture fertilizers and it produced the Green Revolution of the last century which is the basis of our urban society and wealth today. At a garden level, nitrogen fixation is used in vegetable crop rotation, with smart gardeners being sure to grow peas and beans in different parts of the vegetable garden each year, leaving their roots and those precious nodules behind to keep the soil fertile while we harvest our vegetables. Planting clover in a lawn can similarly reduce the need for fertilizer to keep our turf healthy and green. In farming too, with corn and soya the main crops today, that rotation provides much-needed nitrogen and reduces our dependence on the energy-hungry Haber Process, which consumes about 2% of our global energy every year. So Nitrogen Fixation, at first a gift of nature, now also a gift of science, is perhaps the most fundamental process maintaining and developing our modern lifestyle, as well as a useful technique for home gardening. Either way, we cannot live without it. Thank you for this clear set of explanations. So, what is the role of trees? Locust trees are legumes, aren’t they? But my understanding was that trees generally have a nitrogen fixation feature. Hi Alice, and thanks for your comments. Yes, locust trees are legumes, and legume trees, of which there are thousands of species, do fix nitrogen, and they play an important role, especially in the tropics. They are also widely used in land reclamation and agroforestry. 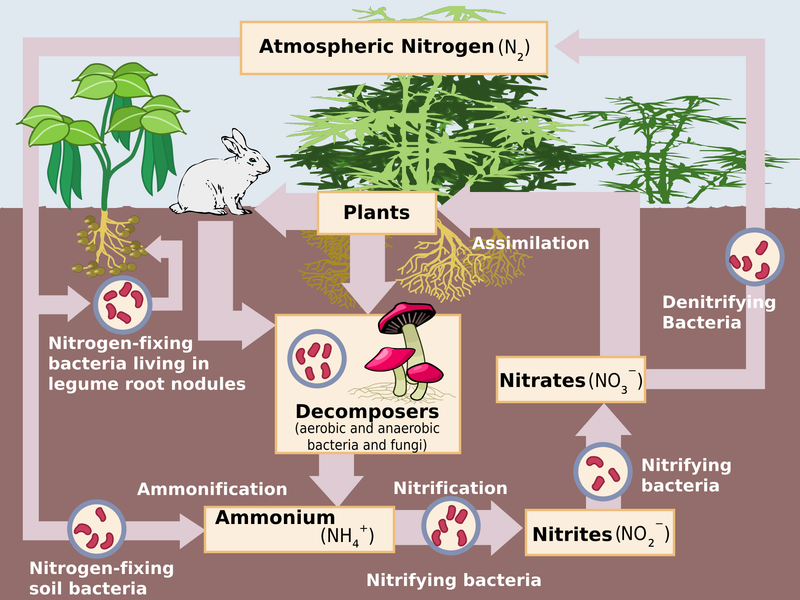 What we have to realize though, is that the nitrogen trapped by legumes is not released into the soil until decomposition occurs, which means that legume trees, unlike shorter-lived crops like clover, don’t put their trapped nitrogen into the soil any time soon. It could be 100 years or much more before the tree matures, dies and decomposes completely, although there will be re-cycling much sooner from fallen leaves. I don’t have comparative figures for the relative contributions of leaves and wood, or for the typical re-cycle times, but you can see the general idea. I think that leaf-litter will be a significant contributor in the short term. Also, for plants, the source of nitrates and ammonium – the only forms they can absorb directly that are useful to them – are all the same – biological or human. The problem with Haber-Bosch is over-use, and use in water-soluble forms, not its use per se. Like everything else really, it what we do with it, not its actual existence, that is the problem! By the way, most algae blooms are caused by phosphates, not nitrogen (although some are from nitrogen). The main sources of that are sewage water and soaps, since phosphates are strongly held in the soil, and run-off is very minimal. It was washing powders used in cities that caused most of the algae blooms, not farmings fertilizing their fields.